From now on it's go time! In this topic after this post we can discuss everything related to the tournament, but first, the Bracket! Note that this bracket is no longer up for change. Players pick 3 different countries to play. Any, Any(Allies) and Any(Soviets) are not allowed. A player cannot pick a country he already played in this round. Players pick 1 single country, preferably their strongest and stick wit that for the entire round. Any, Any(Allies) and Any(Soviets) are not allowed. - Should a 1vs1 Red Alert map out of the Mapmaking contest win, This map will be the 10th map in the pool. - Commentators & Spectaors: Hecthor Doomhammer, FiveAces, SoScared. No other Spectators allowed! During this week I will personally inform the participants on when they are scheduled / expected to play via PM. Let's make this a tournament to remember! After months of preparation, planning and organizing, I will be joined by FiveAces, SoScared and Jazz as co-commentators as we stream the entire event on my Channel on twitch and the first day of the tournament will consist of 5 match ups, 2 of which are Quarter Finals, so it's going to be a long stream! We will be resent in the chat early on, and probably go live a little earlier. At the end of this countdown I hope that we can start the first match: Kwendy vs Anjew and I hope to see you all then! 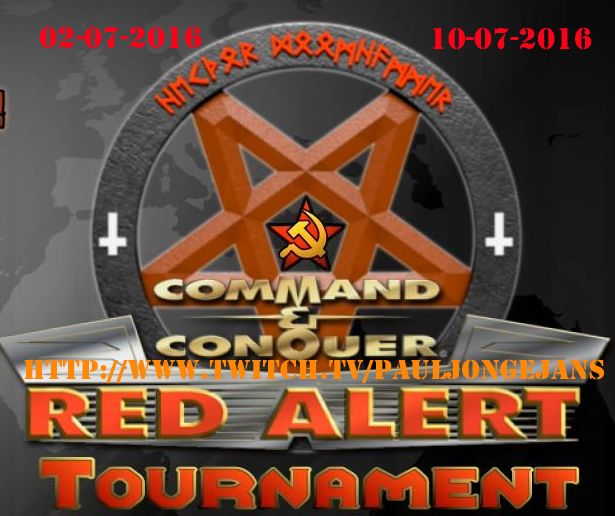 With Day 1 of my OpenRA Red Alert Tournament being such a huge success, I am excited for tomorrow, July 3rd, for Day 2. We've got a total of 6 match ups ready for tomorrow: The last 4 Matches of Round 1 and the last 2 matches of the Quarter Finals, so this will be another long stream, hopefully going as smooth as today. As always, the place where you can watch the tournament is [/url= http://ww.twitch.tv/pauljongejans]my channel on Twitch[/url] and I will once again be joined by FiveAces, SoScaredfor casting and Jazz_KCS for the technical support.